As John Atkinson (right) and I were saying our goodbyes until the 2009 CES in Las Vegas, RMAF co-directors Al Stiefel and Marjorie Baumert were compiling attendance stats for this year's show. Although the fact that there were far more rooms this year, with exhibits spread over two hotels, left some exhibitors thinking that attendance was down, attendance was actually up just over 7%. Almost 3500 people attended this year's RMAF. The Sunday walk-ins were 407almost 150 over last year. I admit it. I have found YG Acoustics' hyperbolic promotional material off-putting. 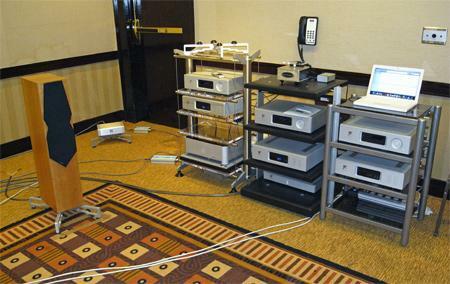 But having recently listened to the Colorado company's 4-way Anat Reference Professional speaker system in Wes Phillips' systemhe is reviewing it for our February 2009 issueI made a point of seeking the speaker out for a longer audition at RMAF. 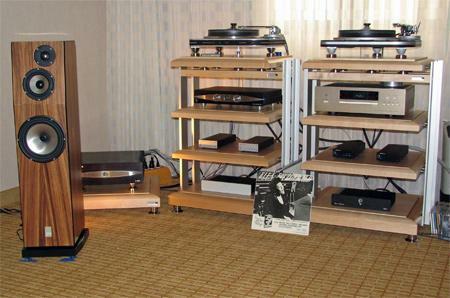 Luxman and Vivid distributor Philip O'Hanlon, of On A Higher Note, always has a great selection of music at Shows, and RMAF was no exception. 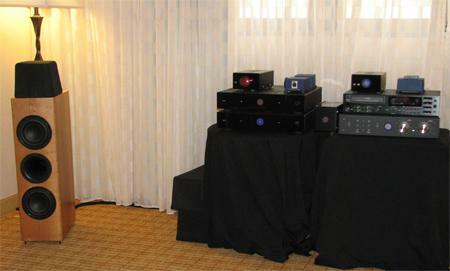 With a system based on Vivid B1 stand-mounted speakers ($13,500/pair) driven by a Luxman 30Wpc class-A integrated amplifier via Synergistic Research cables, the sound of an open-reel dub of a Reference Recordings Malcolm Arnold orchestral piece was distinguished by an enormous, stable soundstage, and excellent dynamics, with superb resolution of low-level orchestral detail. 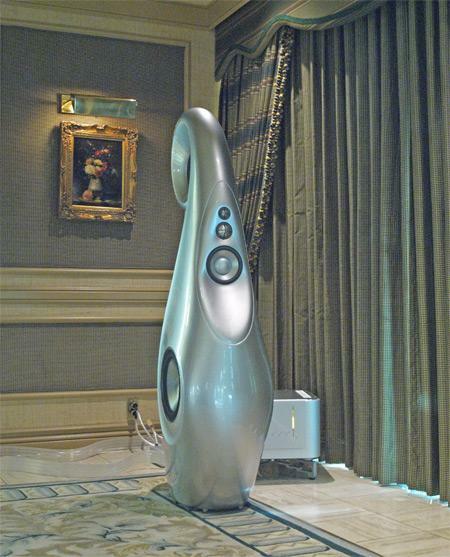 But I just can't get used to the speaker's alien-pod appearance. 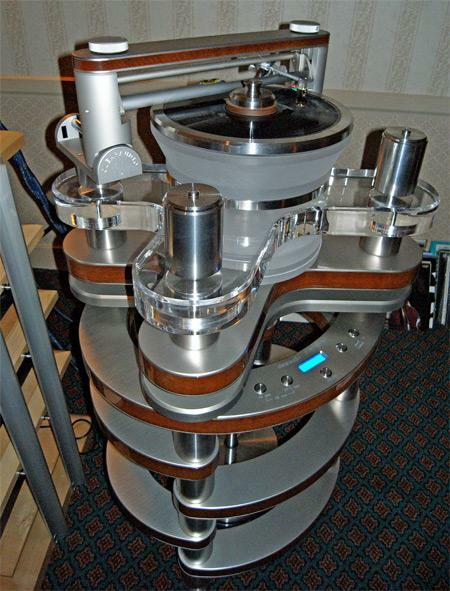 RMAF was my first chance to hear the new McIntosh MT10 turntable ($9500) that had starred in our 2008 CES blog. 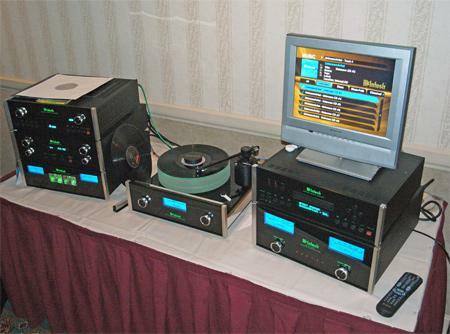 But after I had listened to vinyl on the McIntosh system for a whileand very good it sounded, tooRon Cornelius drew my attention to the MCD500 SACD/CD player ($6500) at the top left of the stack shown in the photograph. 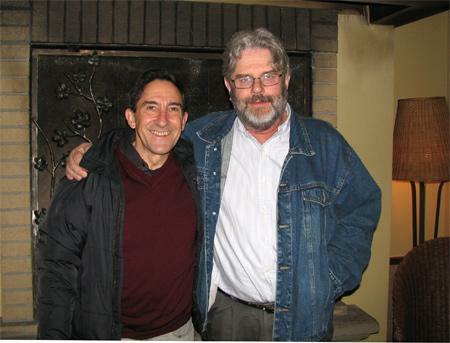 On Saturday night, Bay Area Audiophile Society coordinator Bob Walters gave me a list of rooms he urged me to visit. Since two were on the 10th floor of the Marriott Tower, on which I had not yet set foot, I resolved to check both out. I'm glad I did. The tenth floor of the Marriott was like a gold mine. All I had to do was walk down the hall to the next room, and more glorious sound awaited me. Within minutes of running into Jeff Wells, new National Sales Manager for Spectron Audio, I found myself on the tenth floor of the Marriott. Playing my own version of pick a number, any number, I decided to check out the first room on my left. 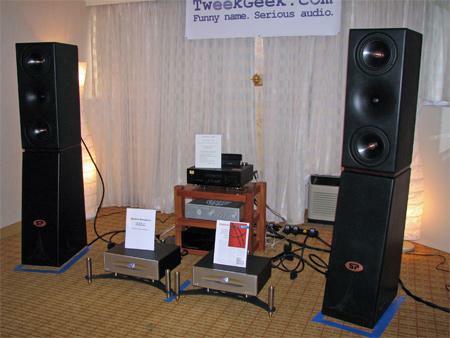 There, in a display sponsored by TweekGeek.com, I discovered two Spectron Musician III class-D amplifiers ($7195 each) driving SP Technology Revelation full-range speakers ($20,000/pair). Something happened in the middle of the tenth floor. In the remaining rooms I visited to the right of the elevatorwith apologies to all those systems I unintentionally missed due to the pathetic human limitation of being unable to be in three rooms at oncethe sound was darker, less illumined, but nonetheless quite involving. 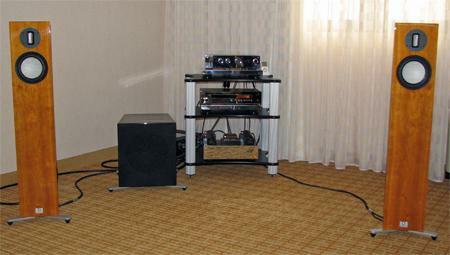 This is actually a sound that large numbers of audiophiles prefer. It's a more seasoned and mellow sound, less apt to sound bright and edgy in live rooms, and closer to the sound in acoustically dampened environments. It's truly a case of different strokes for different folks. I was surprised not only by the ease to the sound of my hi-rez audio files played on the system in the Wavelength room, but also by the resolution. Surprised, because I am not naturally a tube guy, and not only is Gordon Rankin's gear tubed, it is unshamedly single-ended. 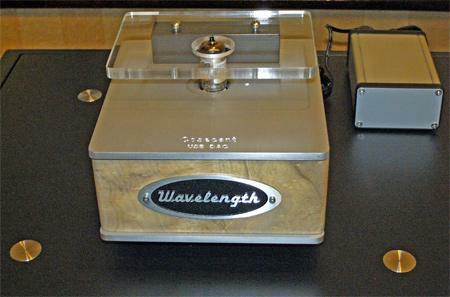 A close-up of the Wavelength Cosecant v3 DAC ($3500) that I used for my hi-rez dems. Using a single 6GM8/ECC86 dual-triode to drive the single-ended, transformer-coupled output, this is one of a very few USB-input DACs on the market that runs the USB link in "asynchronous" mode, whereby the DAC controls the flow of data from the computer and not vice versa, thus drastically reducing word-clock jitter when those data are fed to the DAC chip. I was impressed by its sound, playing 24-bit/88.2kHz files from my laptop, so I have asked for a review sample. As Jason mentioned earlier, I gave 5 hour-long presentations at RMAF entitled "Hearing is Believing—Is Hi Rez Digital the Future of Audio?" 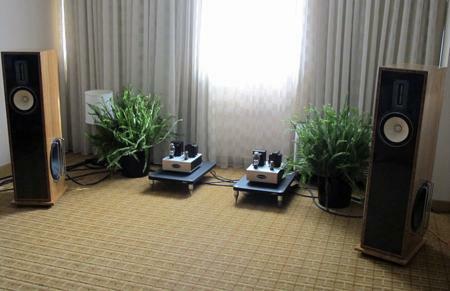 To allow Showgoers to hear the differences between the hi-rez masters of my recordings and CD and MP3 versions, I used a system put together by HiFi+ editor Roy Gregory for his demonstrations of system tuningAyre A7-xe integrated amplifier, Avalon Evolution NP2.0 speakers (which I reviewed in July, Vertex AQ cables, Stillpoints rack and speaker stands, and Quantum QX4 "field generator"to which I added a MacBook running iTunes 8 driving a Wavelength Audio Cosecant USB DAC. There's nothing like being greeted as the audiophile equivalent of the Messiah to either make your day or impel you to run for cover. 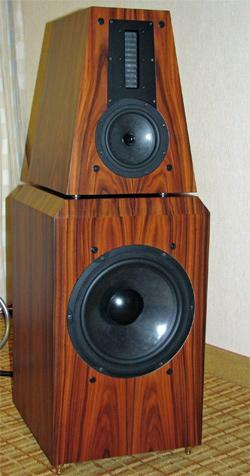 In the case of Peigen Jiang's Eficion speakers, I'm glad I got over my embarassment and stayed. 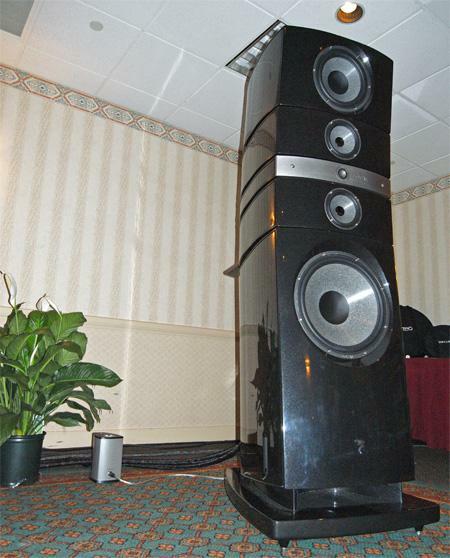 After a short visit to the Daedalus room, during which time Peigen changed speakers and cables, I returned to hear the F200's big daddy, the F300 ($14,900/pair). This is a 3-way, 4-driver vented box, with a rear-firing supertweeter, Air Motion Transformer tweeter, and copper shorting ring on the woofer to facilitate tighter bass. Frequency range is 24Hz40kHz, sensitivity 89dB, and weight 158 lbs each. The speaker comes in two parts, so that the mid-and high-range unit can be used separately as a center channel with an impressive frequency range of 40Hz40kHz. Associated components were the same as with the F200. As I walked into the E.A.R./Marten room, Nat King Cole's voice sounded as beautiful as I have ever heard it reproduced. Through the modest-looking Marten FormFloor speakers ($6500/pair) and Marten FormSub ($4500), Reference Recordings' triumphant version of Rachmaninoff's Symphonic Dances was so thrillingly full and colorful that I could not hide my amazement. On Dialoghi, a demonstration-quality CD from Bob Attiyeh of Yarlung Records that Robert Levi of the Los Angeles Audio Society urged me to play, the sound of Elinor Frey' cello was as warm and beautiful as anyone would ever want it to be. I was in love.